As a part of our 40th Anniversary celebration, we are offering 40 days of wood frames on sale. From now until August 7th, all of our Econo-Wood mouldings are 20% off. This collection is American Frame’s most popular wood assortment. The frames are prized for their low price and diverse and transitional styles. In this collection you’ll find everything from natural oak to silver and gold leaf and even bamboo! In addition to the wonderful styles we offer, all the mouldings are solid wood and custom crafted to your specifications in the American Frame tradition. The Econo-Wood collection is perfectly suited for photographs, memorabilia, and small paintings. Below, you will find some examples of a few of our expertly crafted Econo-Wood frames featuring artwork from our online gallery. This is Econo-Wood 8819, in Cherry. This frame features a square face with a linen looking finish. 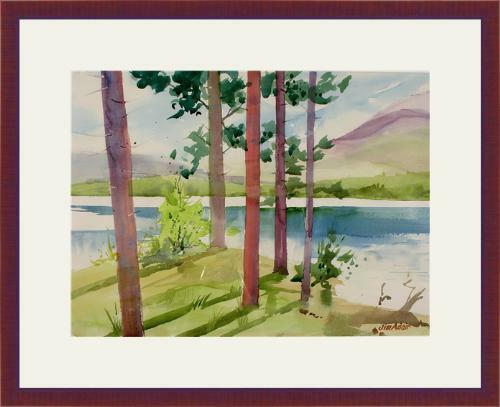 Here, we have framed a painting called Cooper Lake by Jim Adair. 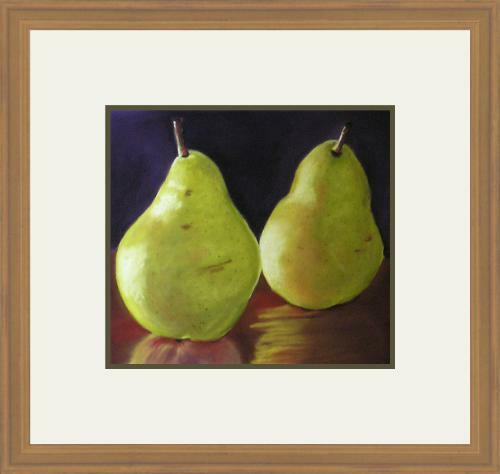 This moulding is Econo-Wood 203235, in Brushed Gold and framed in it, we have a painting by Kathryn Day, called Pears. 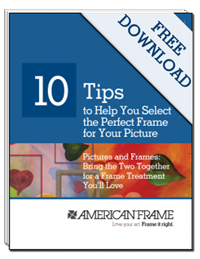 This frame gives art a soft finish and features an antique gold finish. It is thick enough to frame a ¾ inch canvas or multiple mats. 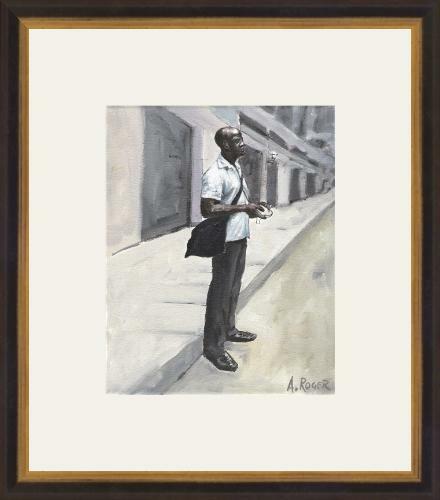 This fabulous moulding is 203239, Econo-Wood, Black with Gold and framed, is a black and white painting called Curb Chad, by Amy Roger. This moulding has a prominent antique gold lip and an architectural ridge that is black with red tones. Econo-Wood 80033, Black. 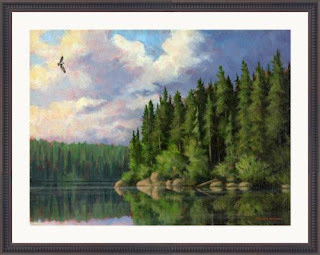 Featured here is a reproduction of an oil painting called Wenasaga River, by Bruce Morrison. The face of this frame has a scallop design and is also wider than the other options above. As you can see, the Econo-Wood collection is an eclectic and economical choice for your general framing needs. The breadth of styles that Econo-Wood provides is great for fine art reproductions, original artwork, paintings and even photos. To see some other items we’ve framed with Econo-Wood frames (among others) see our “Before and After” board on Pinterest.